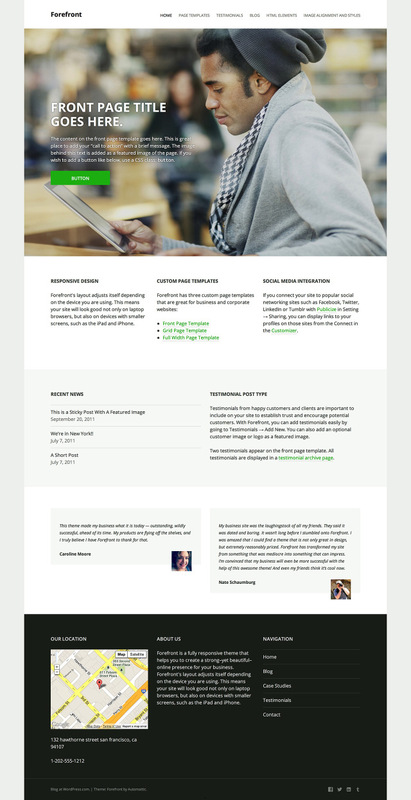 I discovered a new WordPress theme today, thanks to a tweet from Ian Stewart, called Forefront. Forefront is a business theme by Automattic that is available on both WordPress.com and on Creative Market for WordPress.org users. Forefront has its own domain, which is interesting. They don’t do that too often as far as I’m aware. I like seeing Automattic get into business themes. And Forefront also uses a Jetpack module for testimonials, which I didn’t even realize existed. So there’s that. Forefront costs $75 — a pretty good deal for a theme that’s as flexible as this one seems. Of course, if you want even more flexibility in a business theme, it’s hard for me not to mention Basis by The Theme Foundry (who sponsors this site). Their page building tool makes it very flexible, and it’s available on WordPress.com and for WordPress.org. I recently saw Tom McFarlin used Basis for the landing page for his new Mayer blogging theme, which also just launched on WordPress.com. So there you have it, three theme recommendations in one. So menus, testimonials, and comics? I vaguely remember comics as an announcement, but not the others. I learn something new every day.